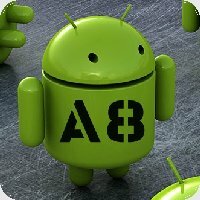 A8 is a native android application that install and run S8 in a WebView. With A8, you can access native resources of the device and any contents from local storage and/or Internet. After loading, the application will search for local customization file (at /sdcard/A8/Configuration.json) and run with resources stored in application storage, in your device's storage and/or remote contents from Internet. It is easy to customize boot process editing the Configuration file. If there is no configuration file, the application will boot using internal resources. If you want to change application code or learn how to embedd S8 in Android devices, loggin the U8 service, press the "more options" button of "Start Coding" and select "Android" platform. Download the application file (A8.apk) to your Android device and run.